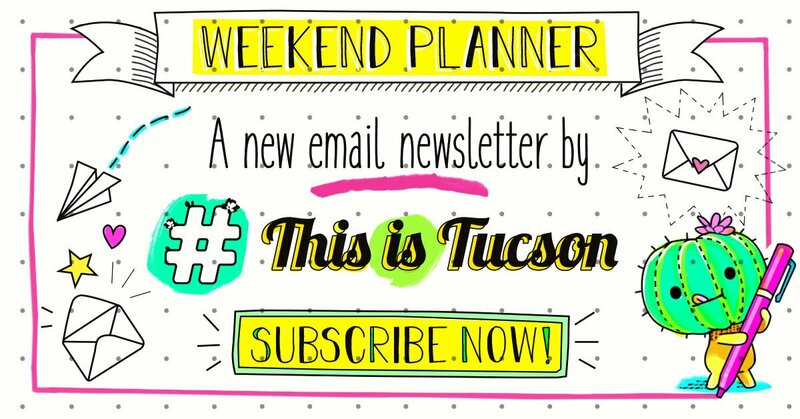 Maybe you're having a hard time making it to a holiday market this month, or maybe you're in a different part of the world and just want some Tucson cheer this season. Either way, Esty gives us a chance to shop local without ever leaving the couch. Here are some items we currently have in our shopping carts — all of it made and sent from Tucson. We also listed everything from inexpensive to v-pricey. Give a little bit of Tucson to someone who can't visit the iconic Miracle Mile neon cactus sign whenever they want. Larilla Shop makes these stickers along with other fun Tucson-inspired products. 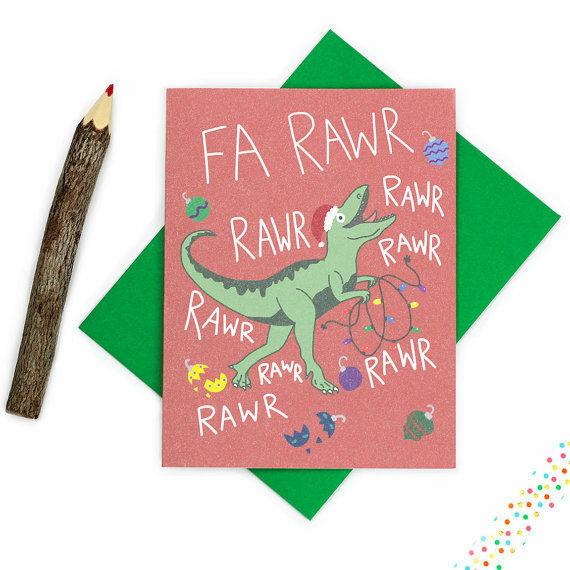 This card is so full of holiday cheer, the recipient will be singing "Good King Wences-saurus" in no time. Etsy shop Turtles Soup specializes in unique greeting cards, enamel pins, stickers, buttons and a lot of other cool stuff. This gift will give the merperson in your life a chance to swish their fins in a pool (okay, bathtub) of glitter and sea goodness. The Pure Poetry Cosmetics shop also has other fun bath-time treats like lavender bubble bars and Harry Potter themed bath bombs with surprises inside. This nail polish is so blinding, you might need to include sunglasses with your gift. Lacquistry creates nail polishes out of super fine partials of reflective metal for an overall texture and appearance that is completely unique; no glitter required. Try the Amazeballz line, a silvery concoction that comes in a variety of finishes and shine. With more than 150 unique candy flavors like Lavender Cannoli Cream, Prickly Pear Lemonade, and Honeysuckle Pineapple, these lollipops make perfect stocking stuffers. Lollies By Leah candy is made with cane sugar and no processed syrups. Read about the woman behind the business here. Now we all can smell like desert rain while keeping our skin nice and fresh at the same time — it's a Tucson beauty win-win if you ask us. This product packs a punch as creosote has anti-fungal and antibacterial properties and rosemary is a powerful antioxidant that helps with cell regrowth. Find more of Sonoran Rosie's natural herbal products here. Made with white clay and hand-mixed glazes, these mugs from Ceci Ceramics are as beautiful as they are useful. Also, be sure to check out the shop's Muchacha Mug line. Who says math and fashion don't mix? This scarf's pattern is designed by Robyriker and features actual math equations from algebra, calculus, geometry and beyond. Read more about brains behind Robyriker here. Woolies cactus dolls are made with natural materials like cotton and sheep's wool, making them soft to the touch and eco friendly. Buy it for the desert baby in your life! These subdued stunners from Aris Designs Jewelry are so chic and cute, we want to wear them with everything! In fact all of the pieces in this shop are all about the beauty in simplicity. Pick it up for the person who enjoys the fancier things in life. With notes of creosote, ocotillo bones, and lost canyons, (we don't really know what that means either 🤷‍♀️) this perfume by La Curie will make you feel like you're never too far from the Sonoran Desert. Discover more beautiful scents by La Curie here. Yes, we know it's pretty penny — but between the stellar online reviews and the fact that Classic Rock Couture put an Arizona sunset right on the back of the jacket, we're straight swooning. Whoever you give this to is sure to have it in their wardrobe forever. Or heck, get it for yourself 😉. Leah Allen is a renaissance woman. It's a busy month with Christmas and Hanukkah events, markets, performances, classes and more. Get ready to feel the Tucson holiday cheer this weekend as the neighborhood of Winterhaven kicks off their 69th annual Festival of Lights.